This annual West Chester tradition, hosted by the Greater West Chester Chamber of Commerce, will kick off Friday, December 1st at 7:15 pm! The parade promises to provide a seasonal mix of traditional elements with a modern twist—local schools, businesses, volunteer fire companies, and other service organizations will join the many marching bands, floats, and antique vehicles that have cemented themselves as mainstays in the Old-Fashioned Christmas experience. The 2017 Coatesville Christmas Parade will march down Lincoln Highway in Coatesville Pennsylvania on Saturday, December 2nd at 10 AM. The Christmas Committee is working hard to bring you the best Christmas celebration ever. 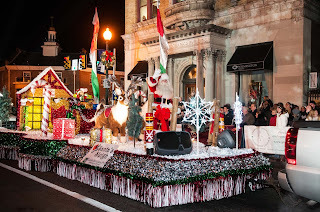 Come join us on Saturday, December 9th when Lancaster Avenue comes alive with the sights and sounds of Christmas! The Christmas Parade will begin at 3:00 pm traveling from west to east along Lancaster Avenue.